Setting business goals is essential for any home business entrepreneur. I can't highlight enough how important it is to set yourself some realistic goals and targets for your new business in order to be successful. In order to be successful you need to know what you are aiming at. 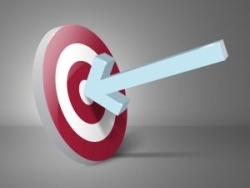 Not setting business goals is like firing an arrow at the target before you know where it is! It may sound obvious but there are many people that throw themselves into a home business without having a clue about what they hope to achieve other than to earn some extra money. If you didn't already know it, there is actually some science behind why setting goals works. It is due to something called the Reticular Activating System which is a part of the brain that filters out information. Effectively it protects you from information overload and focuses on things that it decides are highest priority. It continues to filter information in the same way until we tell it otherwise. Most people recognise this when they buy something new, such as a new car. Say you decide to buy a "flashy new car" having done some research and had a test drive. You may have placed your deposit and are waiting for delivery of your new car. What happens? Suddenly you see "flashy new cars" everywhere. Now, there are no more of these cars on the road, it is just that your brain's reticular activator has been alerted to them and allows them through the filter. Thinking about what you want to achieve and writing down your goals has a similar affect. In order to be focused on success, you need to know what success looks like. Once you have completed the section on Setting Personal Goals and have them firmly set in your mind, you are ready to consider setting longer term business goals for 3 years and 5 years. For example, you will need set your income targets and what you want to achieve with your business at each milestone. If you have a firm idea of your business, also consider what your targets for the following might be at each milestone. Not all may apply but it will give you something to consider and plan for. Work Hours: Do you want to work part-or full-time, the ability to work when suits you? Work location: Work from wherever you want to or from a specific location? Travel needs: Do you enjoy travel or would you prefer to work from home? Income: What will your income be, will you generate residual income? Personal growth and development: How important is this to you? By now you should have evaluated your business or opportunity and have decided to start your own business. If you still need help with this, take another look at my page on business ideas and go through the process again. Now it is time to set some shorter term business goals to focus your initial efforts. You will need to have your overall plan in mind as you do this but setting some short term goals is critical to get into action. If you are just starting out on your home business journey, it is essential that you consider your goals. Research shows that those with goals are far more likely to succeed than those that don't have any. Knowing where you want to be will help drive you to get there and focus your efforts. Starting out in business on your own is tough and if you have no goals you run the risk of drifting and wasting time and effort on things that will not help you to achieve your aims. Once you have a better idea of what business you are going to start, consider setting some specific goals that will help you through your first 90 days. Write down 5 things that you most want to achieve in the next 90 days. Make sure these are things that will stretch and challenge you but that will also help you to achieve specific targets in your business. Specific - A specific goal has a much greater chance of being achieved than a general goal. Achievable - People that set goals that are important to them will find a way of making them work. You need to establish how important this goal is to you and why. Realistic - Your goal is realistic if you truly believe that it can be accomplished. Time bound - You need to set a timescale for your goal. This gives you a sense of urgency and more importantly you will have set your unconcious mind working towards the goal. Goal Setting Forms - Some templates to get you started. Add to your favourite social bookmarking sites. Please note that as I am from England I use mainly British English on my site.